You know by now that I love salads! I am always looking for new combinations and salad recipe. 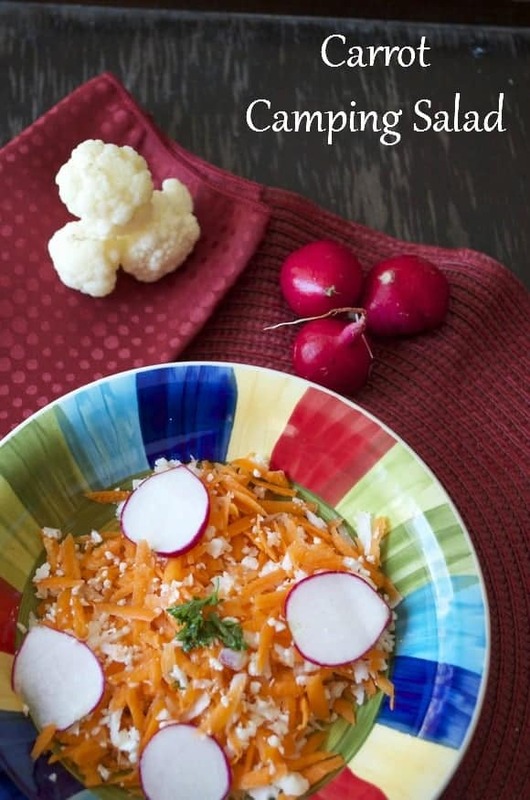 My latest mix was radish, cauliflower and carrots. At first I thought it would turn kind of weird but it tasted so good! With the proper dressing, it makes a great summer picnic or camping salad. I am not a huge fan of camping but some friends are dragging me this summer for another camping trip. (wish me luck). So I was looking for refreshing side dishes to compliment our camping meals . As much as I am dreading this trip (shh, don’t tell my friends), I had so much fun making this summer salad. It is colorful, bright , crunchy and refreshing. Everything I am always looking for in a salad. Just add the seasoning a few minutes before eating. It keeps it fresh longer. 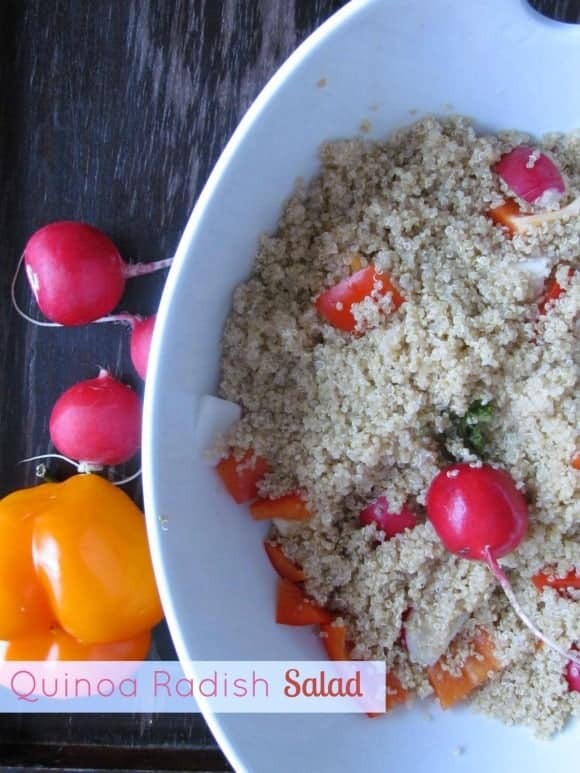 Let’s see how you can make this summer salad for your upcoming camping meal or picnic. 1/2 cup of grated cauliflower. I simply used my Ninja blender (affiliate link) to grate. I find it is quicker and easier. I like keeping dressing simple. I simply added one teaspoon of Balsamic Vinegar and 2 tablespoons of Extra virgin oil. I add some salt and pepper on top of it. My husband added some Dijon Mustard to his mix but I prefer it without. If you don’t like vinegar, you can replace it with lemon juice. It works perfectly. If you prefer to spice it up a bit, check out our Blue Dragon Sweet Chili Vinaigrette recipe. Really, the dressing is totally up to you, whatever you enjoy most! The great thing about this camping salad is that you can make it ahead and just leave off the dressing until you reach your campsite, or you can take the ingredients along in your cooler and make it there. Just slice and shred the veggies before you go to make it easier. 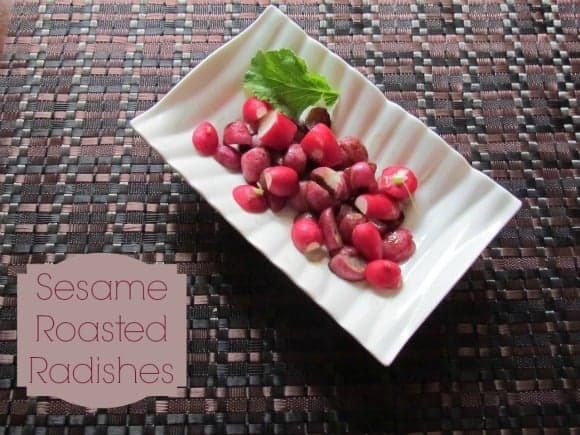 or these Sesame roasted radishes. What would you top this camping salad recipe with? Do you have any favorite camping recipes? Awe…I love camping!! Maybe you will grow to like it!! This dish looks Yummy!! Found you on Artsy Fartsy Mama! I would love if you stopped by My place and shared your stuff on My 2 Favorite Things on Thursday – Link Party!! Yum. This looks like a delicious unique summer salad. I would love to try this salad! These look beautiful! I’m not a radish girl, I’d have to replace with something else, I’m thinking cucumber? I don’t have any camping recipes but it looks like I need to start a collection since I’m camping next month. 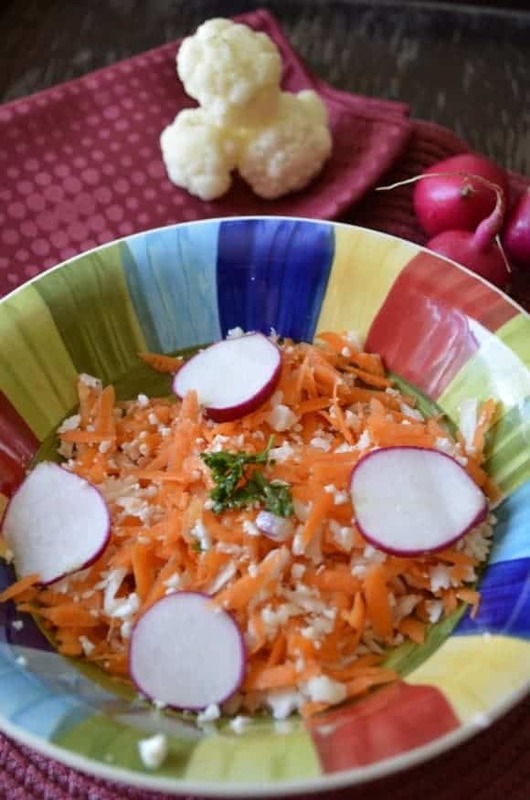 The carrot and cauli salad sounds yummy – simple but strong flavors! That looks so good and healthy. I love the spicy kick that a radish adds. never really been camping, but my salads have to have more than that, not a fan of radishes for sure though. Brave lady — our family went camping exactly ONCE — after that I couldn’t do it anymore. I’m so happy that you are making the effort to prepare healthy foods. I’m not sure what dressing I’d put on the salad, but your family will probably be happy to just EAT after pitching the tent and hiking a ways. Have fun! This sounds like a yummy salad! I’ve never had the combo before, but I can imagine how good it would be! That’s just my kind of dish. Perfect too, for summer eating! Our radishes just came up in the garden so I can’t wait to try out these recipes. Watch this Breathtaking New Beauty and the Beast Trailer!